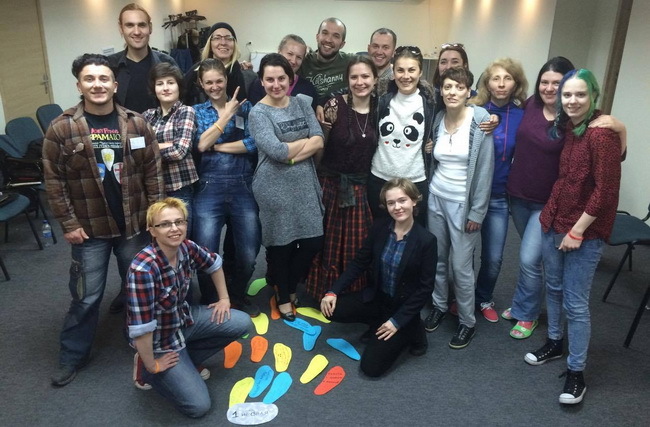 From April 22 to 24 training for LGBT community speakers organized by GAU in frames of raising volunteer potential of the community took place in Kyiv. For three days experienced trainers taught the participants of the training to communicate with the media, use right wording and put messages right. Why does LGBT community need speakers? It was the question Anatolii Yarema, producer and open gay answered the first day: speakers create image of LGBT community and form opinion about LGBT. That’s why LGBT community speakers have to understand current situation with human rights for LGBT in Ukraine, be aware of latest socially important and political events and know how to convey their opinion. Next section of the training dedicated to correct wording was given by Aleksandra Delemenchuk, the expert of Eastern Partnership Minorities Network and development consultant in Centre of Analytics for International Cooperation and Consulting (Georgia). Aleksandra told about correct wording from the legislative and ethical perspective and worked with the participants of the training on the basic mistakes in message phrasing. Special attention was paid to the elimination of misogyny, transphobia and self-stigmatization in speakers’ words. Second training day was led by Veronika Selega, the founder of Aristotle public speech school. She and the participants of the training elaborated working with voice, construction of phrases and communication with journalists. Veronika showed lots of exercises for voice, breath and articulation. The participants of the training learnt how to compose phrases right, make speech more structured and pauses more rhythmical, avoid junk words. During the interview it’s important to feel in control, in particular to control your body that shouldn’t be crooked or uptight. Mimics and gestures must also be natural for a person but in controlled way. “Everybody is fascinated by Veronika, I dare to generalize, and it’s not a surprise. It’s pleasant even to watch and listen to such speaker. I do exercises that she presents and understand that I have perspective for growth and something to go after,” Vitalina, one of the training participants told. It seemed that the most emotional part of day two was bloc of practical training of talking on camera, discussions, conflicts, propaganda and arguments. A journalist from 112 channel was playing an instigator, highly wrongful journalist that was talking in trite and stereotypic words, manipulating facts and asking the participants of the training awkward questions. The trainees beat off his attacks but the journalist still managed to confuse lots of them. At the same time each of participants could understand what gap they had in their knowledge and what subjects they had difficulties discussing. Ukraine’s Gay Forum leader Svyatoslav Sheremet supported the speakers in their urge to fill in those gaps and now they form the list of questions that need clarifying the common position of LGBT movement of Ukraine. Final day of the training was dedicated to the issues of correct messages and communication with representatives of the media. Director of GLAAD programs Ross Murray told of the LGBT community speakers’ target audience, ways of delivering information to it, moments that should be emphasized in the interviews and those that should be avoided. Communicative director of GAU Maria Makarova discussed with the training participants those questions and prejudices that a journalist comes to LGBT community members with. Editorial instructions of journalists were discussed and how they usually influenced the resulting looks of interviews, as well as ways of making yourself safe of twisting and taking words out of the context. At the end of the training Veronika Selega helped the training participants to work on the special task – making video address. The participants divided into six teams and every team had to develop the concept and make video address using knowledge and skills got from the training. First videos of our speakers are available on GAU Youtube channel. Let’s recall that training for speakers is one of the events aimed at raising volunteer potential of LGBT community. During a year GAU organizes series of trainings, workshops and other events for improvement of volunteer expertise and teamwork.